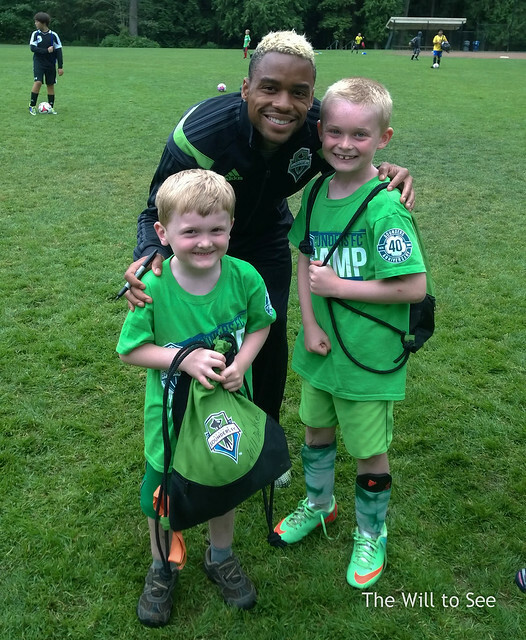 The boys were at Sounders Soccer Camp this week. They weathered through a horribly rainy day on Wednesday and were rewarded on Thursday with a visit from Tristan Bowen, #7 for the Seattle Sounders FC. Tristan scored the final Sounders goal in the game on Saturday vs. Tottenham, which we saw. He was great with all the kids, answering questions and signing whatever they could think of. Tristan’s brother plays for the LA Galaxy and Jack asked a good question about what they say to each other before games. Another great week at soccer camp!